After High School, I flailed. Which is to say I took classes at Mesa College without much of a focus. I enjoyed these classes. Drawing, History of Film, Psychology, Design, Architectural Drafting, Philosophy, Marketing, Broadcasting, Broadcast Studio Operations. This was in 1987-1988 — before we moved to Roanoke Virginia and I shifted my focus to Respiratory Therapy. One class I really enjoyed, but that was technically challenging was Drafting. It took hard work to get “right” but the effort was good. It was utterly different from the free form cartooning I was used to doing. I learned a lot in that class. I think what I learned can be summed up in the spirit of the quotation from this lettering exercise. THESE STROKES; THIRD. 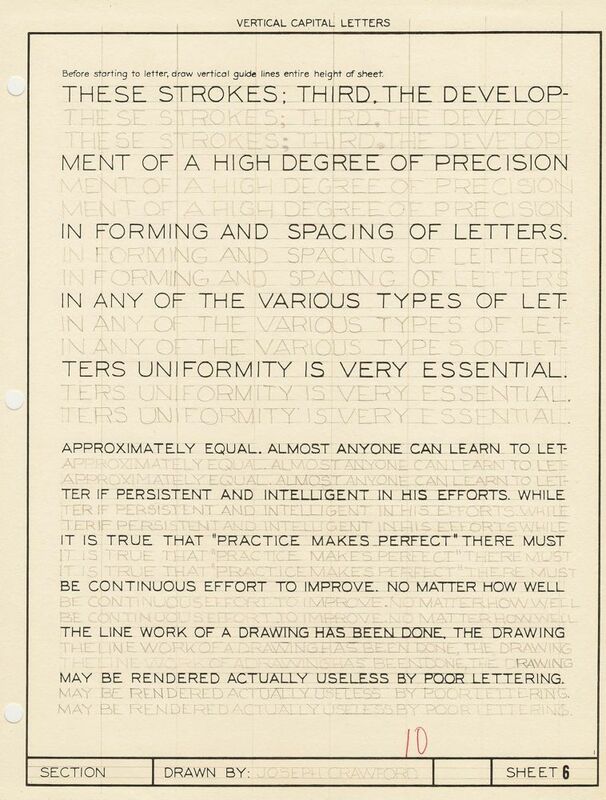 THE DEVELOPMENT OF A HIGH DEGREE OF PRECISION IN FORMING AND SPACING OF LETTERS IN ANY OF THE VARIOUS TYPES OF LETTERS UNIFORMITY IS VERY ESSENTIAL. APPROXIMATELY EQUAL. 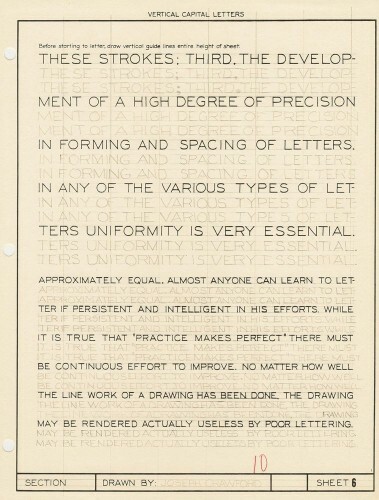 ALMOST ANYONE CAN LEARN TO LETTER IF PERSISTENT AND INTELLIGENT IN HIS EFFORTS. WHILE IT IS TRUE THAT “PRACTICE MAKES PERFECT” THERE MUST BE CONTINUOUS EFFORT TO IMPROVE. NO MATER HOW WELL THE LINE WORK OF A DRAWING HAS BEEN DONE, THE DRAWING MAY BE RENDERED ACTUALLY USELESS BY POOR LETTERING. In short, work hard, get better, pay attention to details. One of my favorite aspects of that class was the fact that we took a field trip to the Nissan Design Studio in La Jolla. It was an inspiration to see them actually applying some of the things we had learned in the class. And even more satisfying in retrospect was the fact that I smuggled my friend Chris Greazel into the class. At the time he was attending Cal State Fullerton and he made the trip special, a two hour drive for about a 2 hour visit. Joe Crawford blogged this at 1:09pm in 2011 in January. The 30th was a Sunday. You are reading this 8 years later. Comment. There is one comment Tweet. Send email. It has hashtags→ Chris Greazel drawings memories . THANK YOU FOR THIS VERTICAL CAPITAL CASE LETTERS! I NEED THIS!